Vladimir Putin referred to the withdrawal of US forces from Syria as a positive development, immediately after his meeting with Recep Tayyip Erdogan in Moscow. While Erdogan stressed that the “US is in favour of creating a zone of security within Syria, we have no differences with Russia on this issue, but competent persons of the two countries will speak on this issue”. Putin was more restrained as he referred the matter to an agreement between Syria and Turkey in 1998 on the fight against terrorism. He basically asked Ankara to consult the Assad regime on the issue of the neutral zone. The Turkish president arrived in Moscow to meet his Russian counterpart. This was the first meeting of the two men in 2019, and despite close ties, their differences in developments in Syria remain. The Putin-Erdogan meeting lasted two hours, and immediately afterwards ministers and officials along with the presidents began talks on current issues. Early on, Kremlin spokesman Dmitry Peskov told reporters that talks with Turkey might last until midnight. 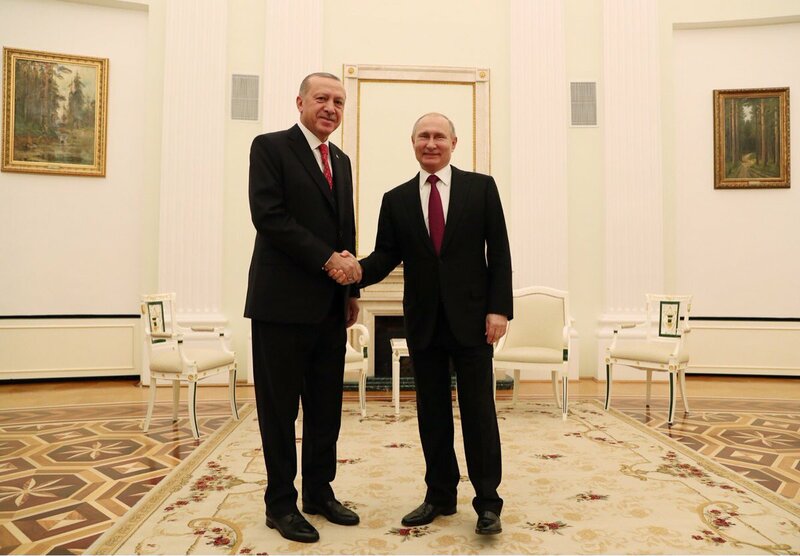 After a head to head meeting, Erdogan said that relations with Moscow are improving at a military, political, economic, commercial and cultural level, stressing that “this helps regional security”. The Turkish president stressed that Turkey and Russia are in favor of the continuation of the agreements between Tehran, Moscow and Ankara on developments in Syria. Putin stressed that “our strategic plans proceed together. And we work together on regional developments and security. For Ankara’s plans for the neutral zone in the Kurdish-controlled areas, he said that “Damascus has to talk to the Kurdish representatives”. The Russian president emphasized the withdrawal of US forces from Syria as a positive development. The two men also discussed developments in Syria, the purchase of Russian S-400 Russian missile systems from Turkey, and the construction of the Akkuyu nuclear power plant from Russia. Syria, however, was the main subject of talks, as the Turkish president has announced an invasion in Mangibiz and the creation of a 30 kilometer safety zone across the Syrian-Turkish border. The announcement by US President Donald Trump on the withdrawal of US forces from YPG-controlled Kurds has brought multiple reactions. Turkey denounces YPG as a branch of the PKK and as a terrorist organization. But the US considers them to be allies against the jihadists. The Turkish president last week had two telephone conversations with Donald Trump, while Turkish Foreign Minister Tsavusoglu with his US counterpart Mike Pombeo. Ankara is discussing with the US the creation of the security zone with the presence of Turkish troops inside the zone. This would cut off any Kurdish contact on its southern border. But this move is expected by Damascus to be seen as a violation of Syria’s sovereignty and to provoke Moscow’s reactions as well. At the same time, the developments in Idlib with the Jihadist branches of Hay’at Tahrir (HTS) moving into areas where Ankara and Tehran have forces, have caused the reaction of Russia, which does not eye well the creation of another area to be controlled by Ankara. The Turkish newspaper Hurriyet, with a front page publication, states that the advance of the jihadists is the task of the facilitation provided to them by the Assad regime that wants to take over Idlib.